AffordableArt101 is proud to offer a splendid selection of original Manet art for sale. French artist Edouard Manet (1832–1883) was one of the most important figures in the Impressionist Art movement. A versatile painter and printmaker, he excelled at portraits, landscapes and still lifes; probably the best known Manet paintings are "Olympia" and "Le dejeuner sur l'herbe (Luncheon on the Grass)". He is associated with other Masters of Impressionism, notably Edgar Degas, Pierre-Auguste Renoir, Alfred Sisley, Claude Monet, Paul Cezanne and Camille Pissarro. We are pleased to offer several outstanding Manet etchings. Edouard Manet original etching "Portrait of Felix Bracquemond"
Medium: original pen-process etching. Catalogue reference: Melot 39. 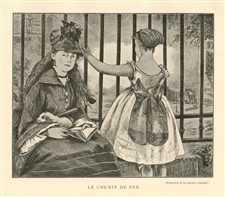 This charming etching was executed in 1865 but not published until 1906, as the frontispiece of the Moreau-Nélaton catalogue raisonné. A total of 225 were printed, but this impression is one of only 20 printed for the deluxe edition on Japon Shizuoka paper. The plate size is 6 x 3 7/8 inches (155 x 102 mm). Not signed. A beautiful impression with full original margins. Medium: original etching. Catalogue reference: Guerin 27 and Harris 31. This charming etching is one of several compositions executed by Edouard Manet on the subject of a boy and his dog. Printed on wove paper, the plate size is 8 1/8 x 5 3/4 inches (207 x 145mm). Signed by Manet in the plate, not by hand. Condition: the margins are irregular, being 10mm at the most narrow spot (see the second photo). Edouard Manet original etching "La Convalescente"
Medium: original etching and aquatint. Catalogue reference: Harris 85 iii/iii. This is a fine impression from the 1884 Bazire edition, printed on laid paper. Plate size: 5 x 4 inches; 127 x 103mm. Not signed. Condition: there is minor foxing. Edouard Manet etching "La femme a la guitare"
Medium: etching (after the painting). This beautiful piece was etched by Auguste Lauzet after Manet, and published in Paris in 1892 by Chamerot et Renouard, for the very rare volume "L'Art Impressionniste", featuring etchings after important artworks in the private collection of M. Durand-Ruel, which was at the time was one of the world's foremost collections of Impressionist art. This print is a fine impression printed on cream laid paper, with a platemark (not shown here in this photo) and good margins; the plate measures 4 3/4 x 6 inches. Not signed. A nice find, with no others currently offered on the market. Medium: color woodcut. This woodcut was executed by Alfred Prunaire after the Manet painting. This impression was printed on thin japon paper and published by Paul Cassirer in 1923. Sheet size: 7 3/4 x 10 inches; 195 x 255mm. Signed in the plate. Condition: excellent (the apparent rippling is exaggerated by the camera). 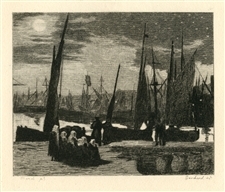 Edouard Manet etching "Clair de Lune sur Le Port de Boulogne"
Medium: etching (after the painting). Etched by French artist Gaucherel after the Manet painting. Published in Paris in 1873 by the Galerie Durand-Ruel for the rare "Recueil D'Estampes Gravees a L'Eau-Forte" portfolio. This impression is on cream laid paper and the plate size is 5 1/4 x 6 1/4 inches (135 x 155 mm). In good condition with good margins; there is a platemark (not shown here in this photo). Signed in the plate, not hand signed. Medium: etching (after the painting). 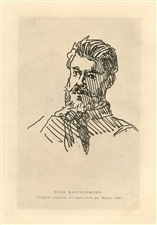 Etched by French artist Charles Jean Louis Courtry after the Manet painting. Published in Paris in 1873 by the Galerie Durand-Ruel for the rare "Recueil D'Estampes Gravees a L'Eau-Forte" portfolio. This impression is on cream laid paper and the plate size is 6 x 4 3/4 inches (155 x 122 mm); the platemark is not shown in this photo. Signed in the plate, not hand signed. Edouard Manet "L'enfant aux cerises"
Medium: engraving (after the painting). 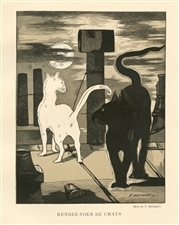 Engraved by French artist Henri Bérengier (1881-1943) after the Manet painting. Printed in Paris on watermarked BFK Rives paper and published in 1910 by the Revue de l'art ancien et moderne. Image size: 6 5/8 x 5 5/8 inches (169 x 143mm). Signed by Manet in the plate (not by hand). Edouard Manet etching "Danseurs Espagnols"
Medium: etching (after the painting). This beautiful piece was etched by Auguste Lauzet after Manet, and published in Paris in 1892 by Chamerot et Renouard, for the very rare volume "L'Art Impressionniste", featuring etchings after important artworks in the private collection of M. Durand-Ruel, which was at the time was one of the world's foremost collections of Impressionist art. This print is a fine impression printed on cream laid paper, with a platemark (not shown here in this photo) and good margins; the plate measures 4 1/2 x 6 inches. Not signed. A nice find, with no others currently offered on the market. Condition: there is discoloration in the top margin (well outside the plate and not affecting the etched image). Edouard Manet "Le Buveur d'eau"
Medium: engraving (after the painting). Engraved by French artist H. Guerrard after the Manet painting. Printed in Paris by Gazette des Beaux Arts. Image size: 7 1/4 x 6 inches (185 x 152 mm) on cream laid paper. Not signed. Condition: there is some foxing and age-toning to the margins, and the margins have been trimmed. Medium: wood engraving (engraved by T. Beltrand after the Manet lithograph). Published in 1902 for "Histoire d'Eduard Manet et de son oeuvre" by Theodore Duret. Printed on smooth wove paper, the image size is 5 3/4 x 4 1/2 inches (149 x 115 mm). Signed in the plate, not by hand. Medium: wood engraving (after the Manet painting). Published in 1902 for "Histoire d'Eduard Manet et de son oeuvre" by Theodore Duret. Printed on smooth wove paper, the image size is 5 x 6 1/4 inches (130 x 159 mm). Signed in the plate, not by hand.